EasyVan at easyvan.com is the low cost van rental service from Stelios, the successful founder of easyJet and easyCar. EasyVan currently provides van hire from more than 160 convenient locations throughout the United Kingdom, including van hire in England, Wales, Scotland and Northern Ireland. 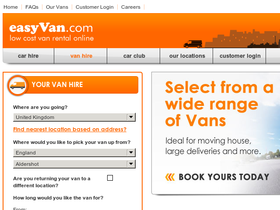 easyVan provide a large range of vans ideal for moving house, large deliveries and more. For money saving deals go to VoucherGurus.co.uk for easyVan discounts, easyVan vouchers, and easyVan promotions. Book your airport parking through EasyVan.com and you can save up to 60%.